Masked ’Well striker Ryan Bowman hasn’t ruled out ‘Zorro’ goal celebration! Swashbuckling Motherwell striker Ryan Bowman hasn’t ruled out a celebration in tribute to fictional movie vigilante Zorro if he scores for the Steelmen while wearing his black face mask! The former Gateshead striker has made two substitute appearances in the distinctive headwear since returning from a month out after fracturing an eye socket in an aerial challenge with team-mate Charles Dunne during ’Well’s winter break in Tenerife. “There has been banter with the boys about my mask,” the 26-year-old told the Motherwell Times after playing the last 40 minutes of Saturday’s 1-0 win at Dundee. “When I first mentioned I was going to get the mask, a few shouts came out, ‘Zorro mask’ and ‘50 Shades of Grey mask’! But it’s all fun and games. “I haven’t actually thought about a goal celebration if I score with the mask on, but never say never! “At first when you put it on it’s a little bit uncomfortable. 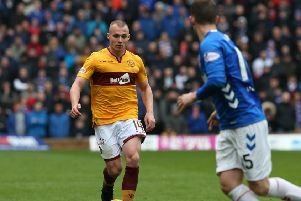 Bowman accepted that the victory at Dens Park – Motherwell’s third success at the venue this season – was achieved despite the Steelmen being under the cosh for long spells and weathering several Dundee attacks. He said: “One hundred per cent that was an example of us not playing well but managing to dig it out, everyone could see that. “But those games show your character more than maybe a two or three nil win at home. When you come to places like this it’s tough. “We were under the cosh for the majority of the game, but when you’ve got the three big boys at the back who can head it all day long, people putting their bodies on the line for each other, it shows a lot of character. With the Steelmen having just five more league games until the split, Bowman said that the victory at Dens was “massive” in terms of boosting seventh placed ’Well’s push for a top six finish. They get a further chance to add points to their tally in a home Premiership encounter against third placed Aberdeen tomorrow night (Wednesday), a game which is being screened live on Sky Sports. “I wouldn’t say if we hadn’t won at Dundee then we couldn’t get in the top six,” Bowman added. “But it would have been a very hard uphill battle. “Aberdeen is a good game for us. The build up before a live TV game is a little bit different, obviously.